We monitor pesticides and heavy metal levels in the catchment and storages. The Australian Drinking Water Guidelines (ADWG) define the characteristics of good quality drinking water including both health and aesthetic properties such as taste and odour. Drinking water supplied by WaterNSW, or by Sydney Water, councils and other customers supplied with raw water by WaterNSW, is required to meet the ADWG. 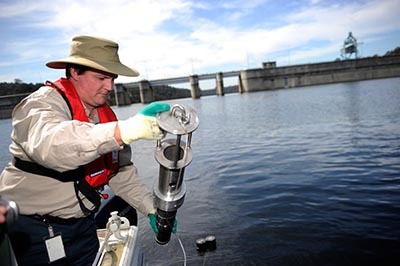 For parameters that cannot be altered by water treatment processes, including pesticides and heavy metals, WaterNSW monitors levels in the catchment and storages, and takes action to ensure levels do not exceed the ADWG. For other characteristics WaterNSW endeavours to meet site specific standards so the customers can treat the water to within ADWG. WaterNSW reports on its compliance with the ADWG each year in its annual report and annual water quality monitoring report. The Australian and New Zealand Environment and Conservation Council (ANZECC) is the peak Ministerial Council for inter-governmental consultation and coordination on environmental and nature conservation matters. ANZECC Guidelines for Fresh and Marine Water Quality - incorporate both community expectations and scientific research, and is a cornerstone of the National Water Quality Management Strategy. ANZECC Guidelines for Water Quality Monitoring and Reporting - examines in detail water for drinking, farming, ecosystems and recreational uses. These guidelines also are a reference for water management and supply. WaterNSW has raw water supply agreements with its major customers which address water management, including water quality. Agreements are in place with Sydney Water, Shoalhaven City Council, Wingecarribee Shire Council, Goulburn Mulwaree Council and Oberon Council for the supply of raw water. WaterNSW also has an agreement with Lithgow City Council for the supply of drinking water. The standards apply to the quality of raw water to the water treatment facilities. They are based on historical raw water quality data and the water treatment facility's ability to treat the water.